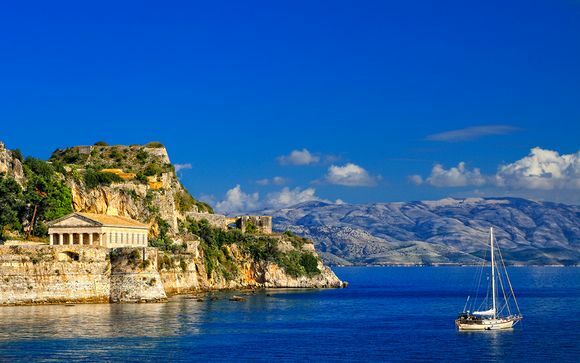 Great deals to Corfu up to -70% off To take advantage of these offers, join now for free! The island of Corfu, with its rich, multi-cultural history, boasts a mix of stunning buildings and beautiful natural landscapes. Due to the influence of the French, the British and the Venetians over the years, the island has some of the most diverse and fascinating architecture in the whole of Greece. The Old Town, which has been granted UNESCO world heritage status, seamlessly blends palaces, majestic public buildings and fortresses with secluded squares and historic, cobbled streets. The area has been likened to Naples or Genoa due to its fascinating architecture. Among the stunning sights are Spianáda, the centre of the city, where the huge square features 19th-century French architecture; Listón, considered to be the most romantic part of Corfu, where cosy cafes attract tourists for coffee and cakes; the 15th century Old Fortress; St Michael and George Palace; the imposing cathedral and many historic churches; Mon Repos Palace and its picturesque park; the fairytale palace of Achilleion and one of Corfu's most photographed places, Kanóni, with its circular terrace offering an amazing view of Pontikoníssi island. If you're a lover of traditional Greek cuisine, you can't fail to enjoy the whole dining-out experience available in Corfu. Greek food offers a huge variety of dishes, for both vegetarians and meat-eaters. The Greek culture is one which promotes sharing meals with others and this is apparent when you step into a restaurant and immerse yourself in its friendly, welcoming atmosphere. All of the cuisine is based on Greek products and particular specialities include fish dishes, cooked with local ingredients. Greece is famous for its rich, sweet wines, including Santorinian Vinsánto. Made from sun-dried grapes, it's aged for at least three years. 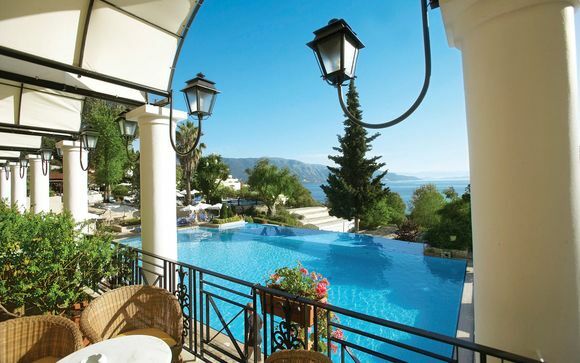 Check out our Corfu deals to see how you can be a part of this world-class dining experience. 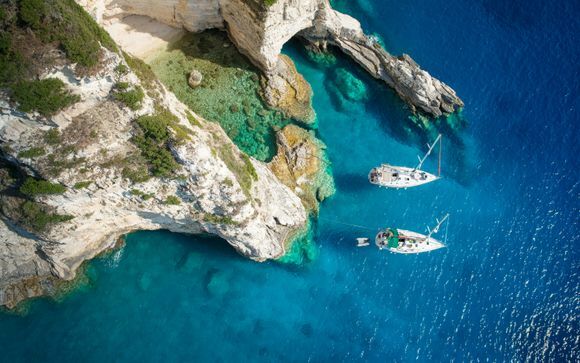 Corfu has a breath-taking coastline, with some of the best beaches in Greece, including Dassia, Agios Georgios, Agios Stefanos, Glyfada and Kavos. 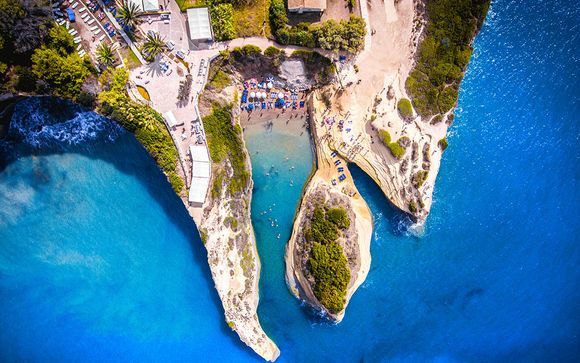 Agios Stefanos is a long, sandy beach located on the shore of a picturesque fishing village, while Glyfada beach is only 15km from Corfu town and has beach bars, turquoise waters and golden sand. There are also a number of five-star hotels and villas which have private beaches on the east side of the island. 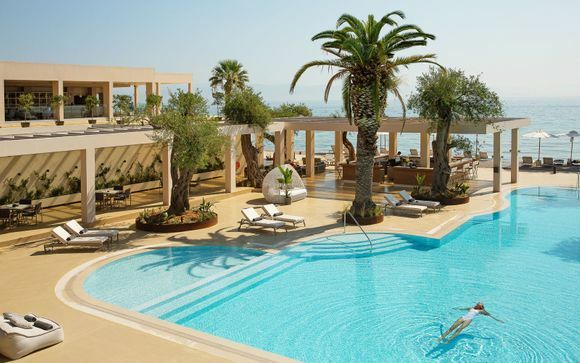 All of Corfu's beaches are top-ranked. 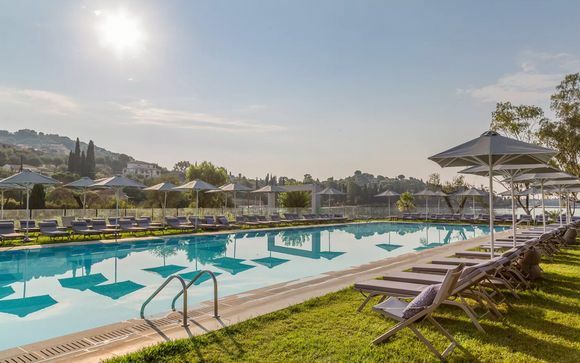 Whether you enjoy sight-seeing, dining out, or relaxing on the beach, sign up today and take a look at our handpicked Corfu holiday deals and selection of luxury hotels at exclusive prices, offering exceptional discounts.